Have you ever watched the golf professionals on television with the lines on their golf balls when they putt? There’s a reason why they do this – because it works! 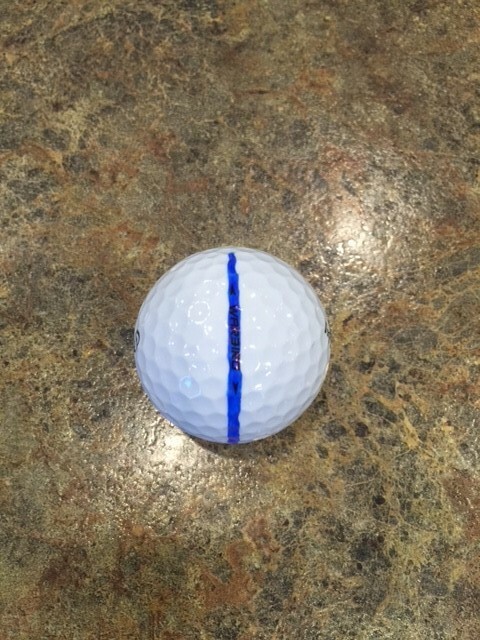 There are many simple tools available on the market to allow you to make this line on your golf ball. Tiger Woods used to be a magician with this as he could draw a line on his ball free hand during one of the majors on a Sunday afternoon. Either way, the line is very practical and could help lower your scores by allowing you to make more putts. 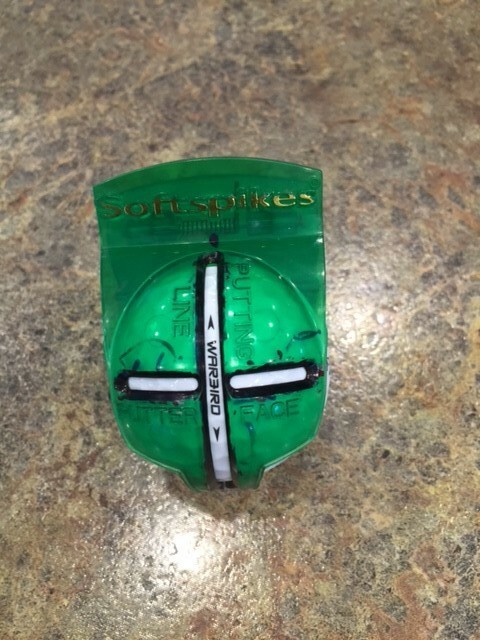 Here is one of the simple tools that is available for purchase at the Golf Shop. 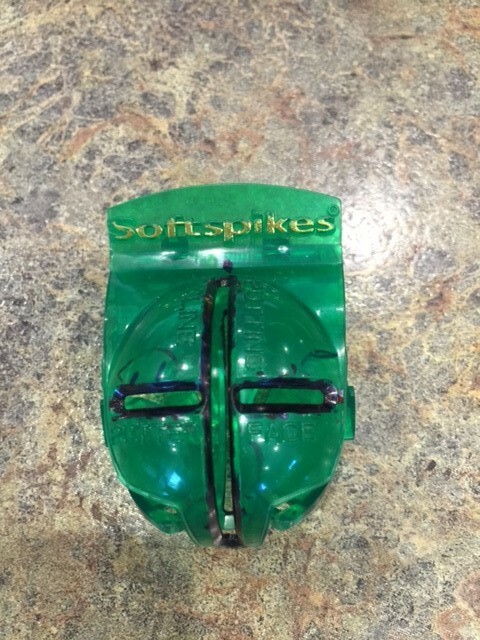 Place your golf ball inside of the device and use your favorite colored sharpie to draw a line on the golf ball. Place the golf ball in the device so the wording on the side is inside of the opening so you can draw a line on it. The wording on the side is on a seam so you will get a better roll out of the golf ball. You can add the additional cross line but I tend to find it a little more distracting. Please see the picture below. Here is what the finished product should look like. There are a lot of golfers that have trouble lining up their putter on the desired putting line. So now you have a line on your golf ball to point it exactly where you want the ball to go! Now you can use the lines on your putter to match up to the line on the golf ball. Please see the picture below to see how everything should be lined up to help you set up and make straighter, more consistent putts. 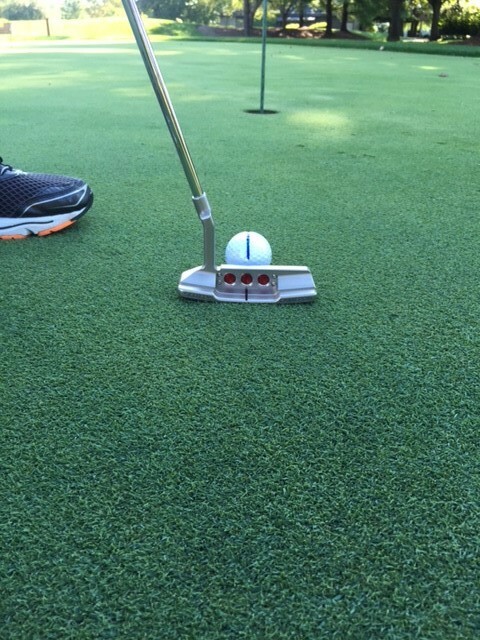 Once you have made your putting stroke, you will have instant feedback on the type of stroke you made. If the ball rolls end over end and the line stays in a straight line then you have made a good putt. If the line on the ball starts wobbling one direction or another, then you have either made a stroke from outside in or inside out, instead of straight down the line. I hope this helps and you can implement this simple technique in your golf game.